Asbestos is still found in many old buildings across the United States. Demolition companies are required by law to hire a specialist who will determine the amount of asbestos in an building, and report his findings to the state government. If asbestos is found in an area, an abatement procedure must take place to ensure safety to people who live and work near the area. Asbestos abatement is a complicated and timely process, but is also necessary to keep people safe. Some companies chose to ignore the risk of asbestos exposure, and as a result many demolition workers contract mesothelioma. In fact, according to the American Cancer Society, 3,000 new cases of mesothelioma are recorded every year. Obviously, demolition work generates a lot of dust and other small particles to fill the air. Most of the time, this dust if filled with relatively harmless sawdust or cement debris that can be blocked from entering a workers lungs with respirators or other equipment. Asbestos is hazardous to workers and people in the surrounding area because it lingers in the air for a longer period of time, and can travel on workers’ clothes which in turn may expose others. 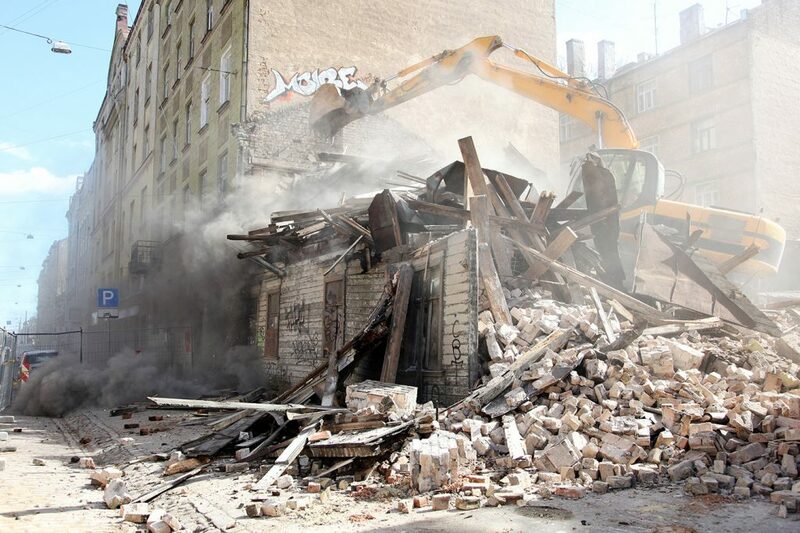 During the course of demolition, asbestos fibers can be blown out of a work area by wind and into the surrounding area where people might become exposed without any awareness that they are in danger. Before the EPA banned the use of asbestos, it was used to insulate materials from heat damage. Thus, it can still be found today in housing tiles, fireplaces, wall insulation, drywall, fire doors, furnaces, and other common building materials. Choosing to avoid proper inspection and abatement of asbestos is a dangerous and negligent act that puts workers, families and communities at risk. How is Asbestos Exposure Avoided? It is the responsibility of demolition companies to ensure the safety of their workers and safety of people nearby. If you have contracted mesothelioma, or believe your company has begun demolition without proper inspection, you have a few options. Your first priority is your health. If you believe you’ve been exposed to asbestos, seek professional medical attention right away. Only a licensed medical physician can tell you if you’ve been exposed to dangerous inhalants, and if your health has been affected. Your next action should be to contact an experienced asbestos injury lawyer. Depending on the situation, your attorney can help you seek compensation via workers’ comp or a personal injury lawsuit. Experienced asbestos injury lawyers are well aware of the damage asbestos can cause, and will attempt to negotiate a settlement that is fair and just. Furthermore, your lawyer should be willing to litigate in court against the party or parties responsible for your exposure. Asbestos can cause debilitating effects on a person’s body and peace of mind. The companies that used asbestos knew the dangers and continued to use it without warning workers or taking appropriate safety precautions. They should be held accountable for your injuries.